As I stood in line at a supermarket checkout recently, I overheard a young couple in front of me querying the cost of their weekly shop. The checkout lady confirmed her till was working properly and she hadn’t put any items through twice. Then the young woman’s face crumpled. “We were just trying to be healthy for once,” she wailed, as her partner, stony-faced, handed over his credit card. Research just out from Cambridge University shows how eating healthily can triple your shopping bill. Apparently healthy eating now averages £7.49 per one thousand calories, compared to £2.50 for one thousand unhealthy calories. That’s a big difference. This probably comes as no surprise. We all know that chia seeds, wild salmon and coconut oil don’t come cheap. But, here at Kale & Cocoa, we loath the idea that healthy food is only for the well-heeled. With diet-related illness now costing the Health Service £5.8 billion (yes, billion), we all have a vested interest in seeking out and sharing our secret thrifty superfoods. So here are some of mine: oats (try our porridge pancakes), frozen berries (try our immune-enhancing smoothie), hedgerow blackberries (try our blackberry muffins), onions and leeks (try our leek and black bean soup), lentils and other pulses, tinned tomatoes, carrots, frozen peas (try our pea and bean salad), cabbage, broccoli and other greens, mushrooms, (check out our faro, mushroom and watercress salad) and eggs (here’s our frittata). But my all-time price-busting superfood? Tinned sardines! My larder contains stacks of them. Not the fancy ones in beautiful tins (although sometimes I splash out on those too) but the cheap and cheerful own-brand sardines in brine or olive oil. Average price? 40p per tin! These nutritional powerhouses are nothing less than “health food in a can.” They’re high in omega-3’s, contain virtually no mercury and are loaded with calcium. They also contain iron, magnesium, phosphorus, potassium, zinc, copper, selenium and manganese as well as a full complement of B vitamins. Don’t buy the filleted sardines – you need the bones! In spite of their impressive vitamin and mineral content, tinned sardines are rather dull – not to mention strong-smelling and visually unattractive. But smash them with some good butter, a few capers, a little mustard and a squirt of lemon, spread it on some wholemeal toast –and, hey presto, you have an easy, hugely-nutritious, quick lunch. 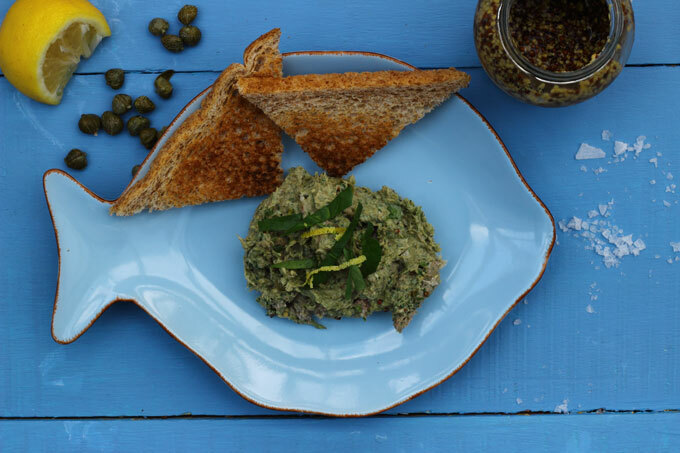 This works just as well without the watercress and you can add more anchovies or capers if you prefer (I love anchovies so I sometimes double the quantity). And if you want it to be less fishy, add more butter. In other words, play around until you find your ideal flavour. Put all the ingredients into the food processor and blend until smooth. Decorate with lemon zest and chopped watercress. Serve with warm wholemeal toast. Cheap, cheerful – and delicious! I haven’t had a sardine for years, well not out of a can, but this recipe sounds awesome so I think I might be tempted back! Thank you for entering #creditcrunchmunch. Thanks Camilla – let us know how you get on. I’m obsessed with tinned sardines and tinned wild salmon – they’re cheap, readily available, sustainable and generally under-rated! Sorry sweets, not cheap in US, Fl. We try to keep a stock of 10 cans of sardines & the same w/Anchovies. I don’t count Anchovies, when it’s open, in it goes. Say nothing and no one will question. PS. never heard of a Sardine filet. That’s very interesting! They are almost the cheapest fish you can buy in Europe…I’m sorry to say! Sardine fillets are more expensive and have no bones. But it’s the bones you need… I often do the same with the anchovies too. Thanks for stopping by and for your comment.